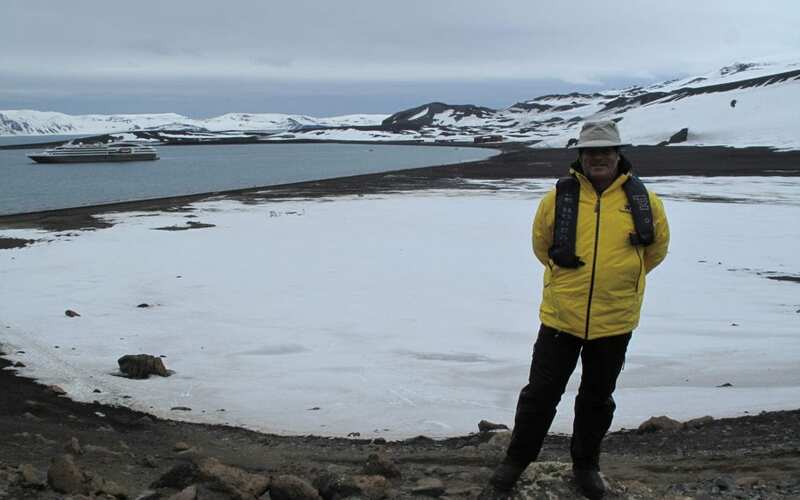 Standing at the monument to the Antarctic Treaty, signed in 1959, at Frei Station gave me considerable reason to reflect upon this extraordinary place, dedicated to peace and science. Larry Hobbs lecture on sustainability did likewise, in terms of Systems and how as human beings we believe we can manage/control systems, rather than being part of a system? Antarctica, the frozen continent surrounded by oceans and her mighty Circumpolar Current, continues to entrance and beguile exponentially. Words fail to describe this mystical place, and as all our guests concur, photographs cannot capture the true essence of Antarctica. Overnight our journey continued on a calm Drake towards the Beagle Channel. From 3-6am there was considerable choppiness on the ocean, creating more movement on board, before we entered the sheltered waters of Patagonia. Geologist, Wayne Ranney gave a superb presentation on the Native People’s of Tierra del Fuego and how humans first arrived in the America’s. With excellent images, Wayne explained how humans moved from East Africa beginning about 200 000 years ago, into Asia, and eventually across the Bering land bridge into Alaska around 12 500 years ago. The Clovis people migrated as far as Venezuela in only 500 years, which for some researchers is too fast. Eighty percent of present Native Americans originate from the Clovis people. Was it the Clovis people who eventually moved down into Tierra del Fuego, across two glacial moraines over the Straits of Magellan into this region? Such folk were land dwellers, collecting some food along shorelines. Hunting Woolly Mammoths with spears was very hazardous. A separate theory involves moving by boat down the west coast of the Americas, via the Kelp Highway, to reach Patagonia. These folk deriving all food from the marine environment. Difficult to examine evidence of these people since old shoreline 300 feet below present sea level, so beyond scrutiny. A third, and much less substantial theory, involves people arriving from Polynesia as Thor Heyrdahl did. If so, no genetic remains have ever been found of these early inhabitants from Polynesia? Irrespective of how they got here, the early inhabitants lived naked, as wet clothing drains the body of heat very quickly, and also promotes disease. Beautifully adapted to this cold environment, the women often diving for crabs, clams and mussels. These tough First Peoples of Patagonia were tragically wiped out in the 1880’s largely by Argentines – a bounty on their heads. A fascinating subject, and beautifully presented by Wayne. Trying to recall these details for the blog taxed my memory somewhat, from a lecture I have never heard before. The African-Patagonian connection reminds me of highly-skilled Zimbabweans clearing landmines in the Falklands, their only complaint being the weather! Sir Francis Drake, English Explorer and buccaneer, discovered the stretch of water between South America and the Antarctic Peninsula in September 1578. Drake went to sea aged 13, and in 1577-80 sailed around the world. During this time, on board the Golden Hind, having passed through the Straits of Magellan (through two Narrows, the glacial moraines referred to above), into the Pacific, they ran into a storm and were driven far to the south. Drake’s nephew Francis Fletcher describes falling in “with the uttermost part of the land towards the South Pole without which there is no main nor island to be seen to the Southwards, but the Atlantic Ocean and the South Sea meet in a large and free scope”. Extremely convoluted English, and the Drake Passage was named. When scurvy was found to be caused by Vitamin C deficiency British sailors were fed a daily ration of Lime juice, hence the name “Limeys”. You may read of the Roaring Forties, but Tierra del Fuego is at 55 degrees South, so these guests have passed through the Furious Fifties and part of the Screaming Sixties. Depending on conditions, a vessel like Le Lyrial takes 48-60 hours to get across the Drake. Time precludes our getting to 66 degrees South, the Antarctic Circle, sadly. One hopes for calm seas known as a “Drake Lake” as we have enjoyed in BOTH directions, almost unheard of. Generally guests fear the Drake Shake with big, heavy seas – part of the “tax” as it is often referred to in order to visit perhaps the most magical place on Earth, Antarctica. Sei Whales, Magellanic Penguins and rarely seen black and white Dusky Dolphins welcome us into the wide entrance of the Beagle Channel late morning. It is clearly not over until the Fat Lady sings. Guests once again being afforded opportunity of great wildlife viewing, and photography. Expedition Director Suzana gave the important disembarkation briefing. Getting 200 guests and their luggage onto flights out of Ushuaia requires careful planning, which A&K excel at. The bitter cold and storms in the USA have created some delays at major airports. Many of the American guests are going home to considerably lower temperatures than they have enjoyed in Antarctica. Le Lyrial will be turned around in Ushuaia tomorrow, and departs for Antarctica with new guests in the evening. Notwithstanding the cold and storms delaying their arrival into Ushuaia. After the disembarkation briefing, the expedition DVD was screened, ably filmed by videographer Cassandre. This DVD is for sale and serves as a wonderful memento of this journey together. Watching guests, young and old alike, sliding down snowy slopes brings back marvellous memories, as does the Lemaire Channel, the whales, the penguins, Penguin Island…..it has been a magical journey of discovery and delight. Mid-afternoon, we gathered for a fantastic slideshow/video put together by Richard “Blackjack” Escanilla, using staff photographs and video’s. Yesterday afternoon, whilst doing the final touches on this presentation, Richard’s computer crashed. For some time there was high drama and consternation, before Photo Coach Richard Harker was able to retrieve and restore the missing files. What a relief – Blackjack Richard we are told had gone white! Brought memories flooding back, before a heartfelt thank you from Suzana and Agustin. Denys, the Ukrainian stage manager was given a gift from the Expedition Team, for being so pleasant, able and professional. A truly delightful young man, and pleasure to work with. Captain le Rouzic joined us, to be given a warm hug by Agustin for being such a brilliant Captain. His Open Bridge policy, and charming interaction with guests and staff alike makes him a very popular Commandant indeed. Five Expedition Team members are departing for home tomorrow, and will be replaced by excited new team members. By 4.10pm the Captain and Bridge Officers were bringing Le Lyrial alongside in Ushuaia, under sunny skies and a mirror-calm sea. Seeing the town, other ships and plenty of activity almost an assault on the senses. Many guests have chosen to take a walk into this frontier town, with its lofty snow-clad peaks, and friendly inhabitants. I walked into town for some decent coffee, and free WiFi. Unfortunately everybody back home is sound asleep, so all conversation attempts were decidedly one-sided. A definite anti-climatic feeling realising that this expedition is over. We very much hope they return home changed individuals on account of this Antarctic experience. Hapag-Lloyd’s MV Bremen is opposite us on the pier. I have not had opportunity to enquire whether anyone I know is on board, but I have very special memories of Bremen, both here (my very first expedition) and the North-West Passage. I fear they remember me as the mad South African in shorts? Great company and lovely ship. For me personally, this has been an incredible past month, and I now cannot wait to get home. For those who have been gracious enough to read my blogs, thank you sincerely. This is my last scribble from the South, unless flights home are worthy of mention, and I very much hope they are not! Farewell for now, one and all.